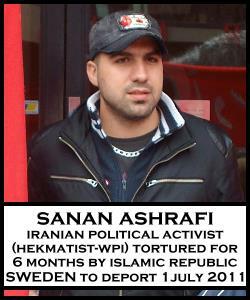 The date of deportation for Sanan Ashrafi is fast approaching: Friday 1 July 2011. Due to popular pressure and excellent legal work by Sanan’s lawyer, Bo Johannsson at the Swedish Refugee Advice Center, a bit of optimism has developed with regard to Sanan’s case. However, the battle is not yet won. It remains critical for all of us to continue to exert as much pressure as possible on the Swedish government to ensure that Sanan will not be deported to Iran. 1) The Borderless Refugee Organization has called for demonstration in Stockholm in defense of Sanan Ashrafi. The demonstration will be held on Tuesday 28 June, at 12:00pm Sergel Square, followed by a march to the Swedish Parliament. Notably, Mehdi Maleki, whose own deportation to Iran was only recently halted, is helping to organize this action in defense of Sanan Ashrafi. 2) Sanan’s lawyer, Bo Johannsson, reports that if the Swedish Migration office does not reverse its decision to deport in the next 2 days, he will file suit at the European Court of Human Rights to halt the illegal deportation of Sanan Ashrafi to Iran by the Swedish government. FRENCH – Letter-writing action: Non à l’expulsion de notre camarade Sanan Ashrafi! 4) We urge all those who will be in Stockholm on Tuesday 28 June (today) to join the demonstration at noon in Sergel Square. 5) If the situation requires it, ICRIR will call for demonstrations outside of Sweden; we will know more about the necessity of taking such action on Wednesday.